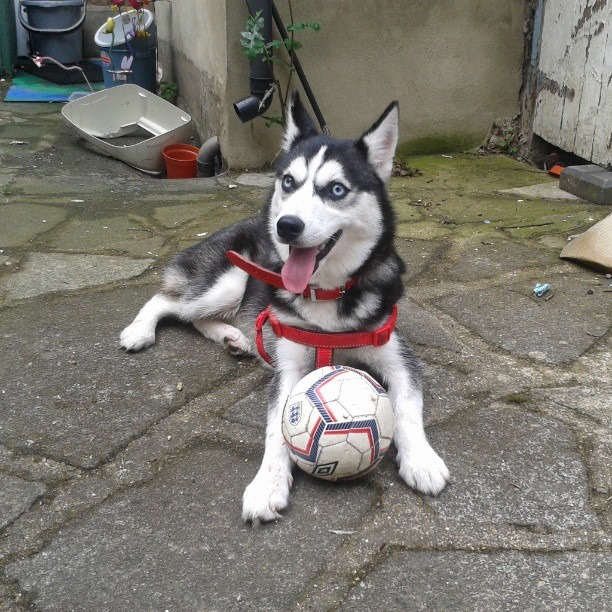 Urgent: Home needed for husky-cross dog. This is Alba. She belongs to my daughter Kathy, but unfortunately Kathy cannot keep her – and sadly, though we’ve been fostering Alba, nor can we as my partner David is sadly allergic to dogs so we desperately urgently need to find a new home for her ASAP. None of the husky rescues can help as she’s not pure-bred husky, Battersea say they can’t take her till 17th Feb, Dog’s Trust are full and can’t help. Alba is a year old, and had her full set of immunisations in February last year so will be needing her annual boosters next month. She has been microchipped. She hasn’t yet been spayed, so that will need to be arranged as soon as possible. She is fit and healthy with no problems and no sign of hip dysplasia. She is half husky, half collie (will grow to be a medium-big dog) so in common with most dogs from working breed stock she is very active and needs plenty of exercise; at present she’s walked twice a day for between 1.5-2 hours each time. At present her recall is practically non-existent – she will need to be walked on a lead until she’s been trained properly, but she’s very alert and responsive so will likely pick it up quite quickly. She is housetrained. She is also very smart and learns quickly. She gets on well with other dogs and is very friendly; she would like to play with our cats but they’re both unused to dogs and run away. She’s quite a keen hunter; she also loves chasing pigeons. She’s rather boisterous although she’s calmed down a bit around Freda, our 6-year-old daughter – probably would not be suitable in a home with small children but would be great for a family with older kids who can help her run off some of that energy! She is incredibly affectionate but does need an owner experienced in working dogs. She is smart and requires stimulation; she would benefit greatly from agility training. Ideally there should be someone home most of the day for her. If you or someone you know can offer Alba a new home, please email me at arkady.rose@gmail.com. With David being allergic to her it’s really urgent we find a new home for her NOW. Please repost & share this; all serious offers will be considered. We are based in E17 (Walthamstow), London.